Solgar No. 7 works differently from Glucosamine Chondroitin. 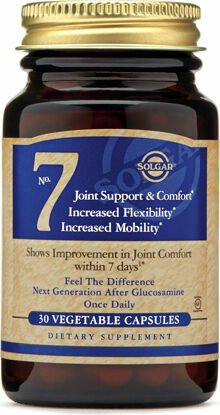 While traditional Glucosamine formulas focus on cartilage support, Solgar No. 7 targets multiple pathways to balance the release of joint enzymes, structurally support collagen building blocks and sensitive joint cartilage...while simultaneously supporting the body's natural range of motion and joint flexibility. For the first time, natural science at Solgar combines the advanced and naturally sourced bio-activity of 5-LOXIN Advanced AKBA, UC-II (Type II Collagen) and Ester-C, with a complex of traditional pepper spices and botanicals. Solgar's advanced bioactives target both structure and function of natural joint motion to help balance out joint stresses, daily wear and tear, and the "overworking" of an active lifestyle. When stiff joints occasionally say no...Solgar No. 7 says YES! If you are pregnant, nursing, taking any medications or have any medical condition, please consult your healthcare practitioner before taking any dietary supplement. Avoid this product if you are allergic to aspirin. Discontinue use and consult your doctor if any adverse reactions occur. Not intended for use by persons under the age of 18. Keep out of reach of children. Store at room temperature. Do not use if outer bottle seal is missing or damaged.